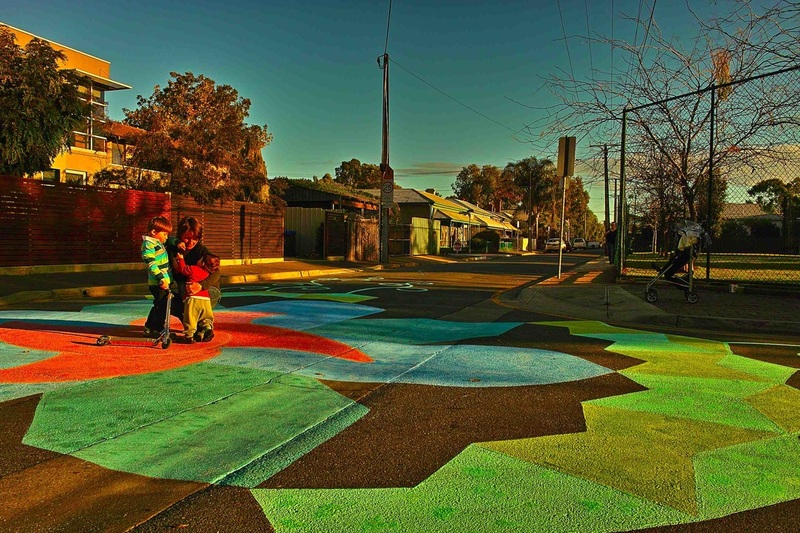 Two sites on Drayton Street in Bowden, South Australia, were painted by locals, school children and artist, Helen Crawford as a method of calming traffic. A glimpse of the First Intersection Road Repair project in Australia. Cnr of Drayton St and Fifth St, Bowden, Adelaide, Australia. 29 May 2011. Environmental Media produced ﻿this timelapse video﻿, and the image above. Environmental Media produced ﻿this documentary video﻿, and the image above. This is a document of the first Road Repair project in Adelaide, possibly Australia. Partnership between local residents, community artists & activists, the local council and children, teachers and parents from the local primary school. This is the longer explanatory video. Includes time lapse footage and picture gallery.